As a rule, I do not read crime novels. Based on my experience of the films spawned by such books – of which I’ve sadly seen more than a few – I expect them to be banal, predictable and unbelievable. To date, no one has been able to convince me that this expectation is unfounded. It was with some trepidation, then, that I cracked open Louise Welsh’s latest offering, The Bullet Trick. 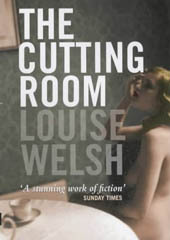 In fact, Welsh’s fast-paced, tight narrative gripped me from start to finish with its engaging cast, well-spun plot, and aura of tarnished glamour. Classing the author strictly as a crime novelist seems a trifle unfair. The unsavoury activities of her characters, and the air of failure that hangs pungent around her protagonist, William Wilson, evoke a subtle complexity – an important distinction. Making her central character a magician was a brave choice on the part of the author. Stage magic is an art form that finds itself constantly scrutinized, under the eyes of both expert and skeptic. The role of magic in the story is expertly handled – and the novel itself is one big magic act, with all the atmosphere of an ancient art which has lost much of its lustre, while somehow retaining the capacity to genuinely astonish. The strong narrative is greatly aided by a tight structure. We follow Wilson’s journey in and out of despair and depravity, alternating between past and present, revealing an intricate plot, whilst leaving our heads in a slight spin. The tension of a life and death situation is slowly, steadily wound up – finally released, in a clever twist. If I have any complaint about this polished novel, it is that the redemptive ending left me feeling unsatisfied. In this world of grit, grime, alcohol, and murder, however, I am not sure that an ending that did satisfy would be believable. There is the twin desire in every audience – and every reader – to simultaneously be dazzled and to see through the illusion. The Bullet Trick is all dazzle. Louise Welsh, The Bullet Trick, Canongate. ISBN 1841958905. £7.99.